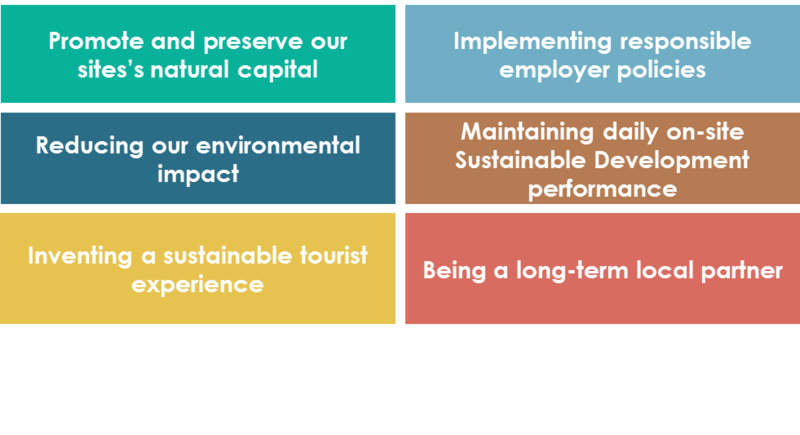 The priorities and goals set by the Group's Sustainable Development approach are defined in line with the comments and feedback received from stakeholders. Discussions are carried out by our teams, who are in direct contact with various other parties. The lessons learnt are included in the company's strategic decisions. Permanent dialogue established with stakeholders is essential to the Group's Sustainable Development approach. All the Group's trades (property development, property sales, tourism, support functions, etc.) have a shared goal: customer satisfaction, brought on by employee satisfaction. This is why the well-being of our employees is a founding element of the Group's human resources management. The satisfaction of all 23,700 owners is managed by the Owners' Customer Relations Department, which uses dedicated communication tools: hotlines, websites, magazines, newsletters. Customer satisfaction and loyalty are what guide the Group's approach to quality. This approach is based on the analysis of satisfaction surveys, opinion websites and social networks, close collaboration with the Customer Relations Department and permanent dialogue with the teams working in the accommodation and villages. As a signatory of the "Responsible Supplier Relations' charter since 2010, the Group has been creating lasting relationships with its suppliers/providers. The Purchasing Division implemented a responsible purchasing process, whereby specific environmental and societal requirements are included in strategic calls for tender, special attention is paid to purchases made in countries deemed to be at risk, and the commitment to favour local purchases. Every year, the Group communicates its sustainable development performance in its reference document, responds to questionnaires drawn up by investors and non-financial rating agencies, and takes part in SRI meetings (Socially Responsible Investing) to talk with analysts directly. For each new project initiated by the Group, a privileged dialogue is engaged in with local communities. That way, concrete commitments regarding environmental performance, employment, the promotion of short supply chains and tourist development are made within the framework of agreements concluded with local stakeholders, and are an integral part of the conventions signed with our partners. Representing 7.3% of France's GDP*, tourism is a huge economic growth factor for local communities. During their construction and operation phases, each apartment building and village contributes to enhancing the local economy and society thanks to the jobs they create, the purchases made and the money spent by visitors during their stay. Above and beyond this economic value, we strive to create close relationships with local stakeholders: tourist office representatives in our villages, collaboration and support protocol for local associations, etc. When developing new projects, the Group also tries to go beyond its legal obligations in terms of dialogue by initiating discussion with local stakeholders.